My son is an avid reader and back in the day when he was looking for a good book to read, I would dig into my library of favorites and pull out something I thought he would enjoy. I take credit for getting him hooked on science fiction by giving him Hyperion, Neuromancer, and Armor to read when he was younger. He still reads the Hyperion series and tells me it's his favorite book of all time. I have to admit is is probably my favorite book as well (the fruit falls close to the tree). So no it's his turn to give me books to read. 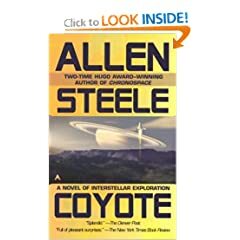 He gave me a book he really liked called Coyote by Allen Steele. It's the story of a futuristic and oppressive America looking for a planet to colonize to take the message into space. Without giving too much away it's less of an epic space travel book and more of a colonization of the new world type book with some high tech (not much) thrown in. It's more about building log cabins than fighting space aliens. At any rate it's a pretty good read, but I have to admit I didn't jump right in and read the rest of the series. It was certainly a good read and some of the story was pretty compelling. If you want a classic Hugo award winning space epic, read Hyperion.